Thank you Mother Earth for giving us such beautiful and valuable things that we literally could not live without. I just love how many cute little scenes can be made with the Whimsy Stamps NEW Build a Garden die set. For today's card I have a little blue bird watering her flower garden. I started off by cutting out a bunch of the flowers and leaves, and the strip on the bottom from the NEW Pretty Pastels 6x6 paper pack. I just love these new papers they are more like card stock weight and have such a pretty sheen to them. I cut out the little birdie from white card stock and sponged on blue ink and used a black marker for his eye and beak. I arranged the flowers and added Enamel Dots to their centers and popped up a couple with foam tape. 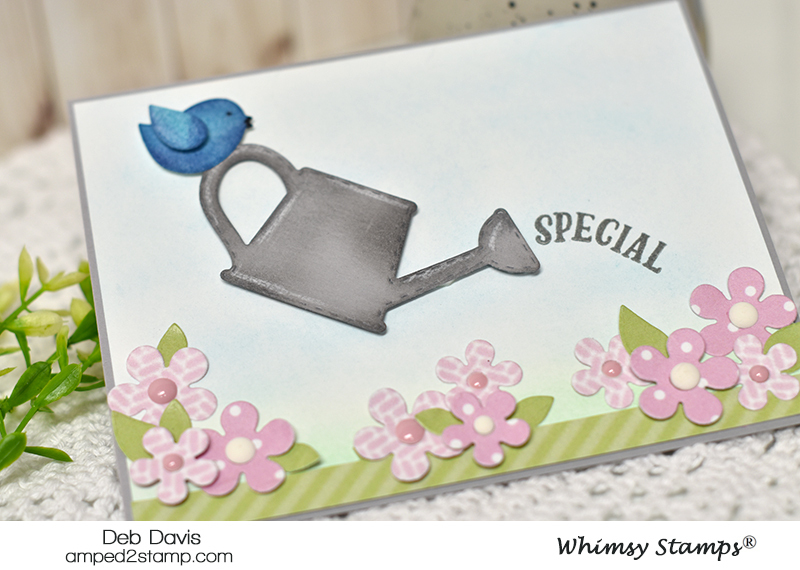 The little birdie and watering can are also popped up on foam tape. The sentiment is from last months Paper Door kit. I hope you like the Build a Garden card and I hope you enjoy this beautiful EARTH DAY! 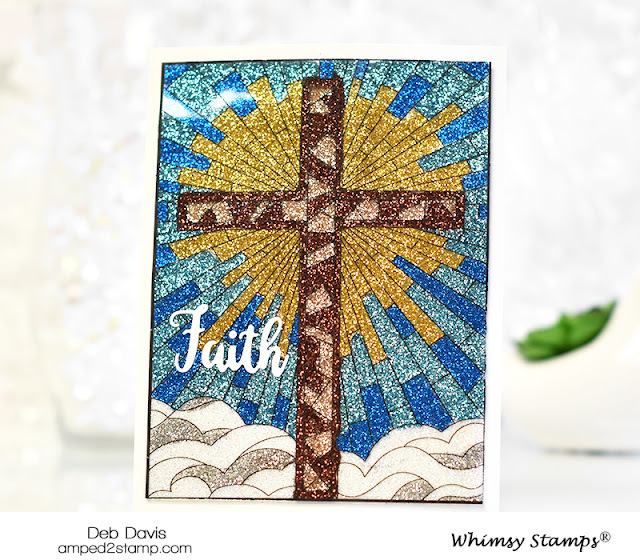 Early Easter Blessings to all who celebrate, and for everyone, I have a cool technique to share with you today using our glorious Holy Cross Stained Glass stamp. 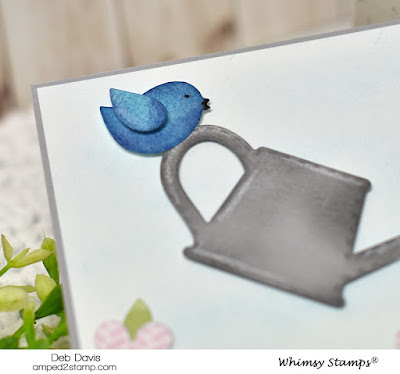 This card may look complicated but it really isn't, it's quite easy to do but you have to be patient for each section to dry...that's the hard part. 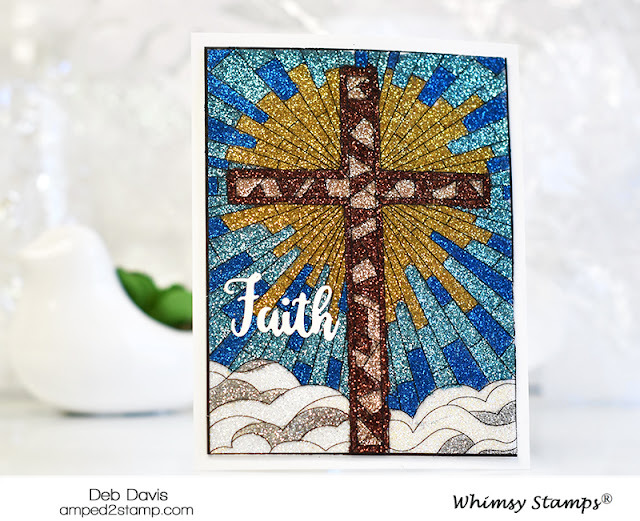 I used the Whimsy Stamps Stained Glass Holy Cross rubber stamp today but all of the Whimsy Stamps Stained Glass Collection stamps are just screaming for this technique which is aptly named, you guessed it, the "stained glass technique". 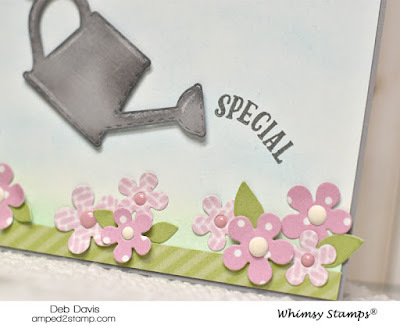 The easiest and least messy way to achieve this technique is to use bottles of different colored glitter glue such as Stickles. The technique can also be done with a clear glue (like Glossy Accents) and adding glitter on top but it's a messier process so I prefer the glitter glues. Step 1 - Cut a piece of acetate sheet quite a bit larger than the size of your stamp. Step 2- Carefully stamp your image onto acetate with black solvent ink (such as Archival or Stazon) and let it dry. Step 3- Turn your image over, you'll be adding your glitter glue to the back of the acetate. Step 4 - Start at the inner most part of the design and add the glitter glue color of your choice to just that section. Step 5 - Skip the section that is directly next to the section you just colored and add glue to the third section, then to the fifth section, then the seventh etc. TIP: move the acetate not your hand because you can accidentally set your wrist into a blog of glitter (ask me how I know - ha). Step 6 - Here's the hard part...set the image aside and wait an hour or more (especially if you put a thick coating) for it to dry. Once it's dry go back and fill in the rest of the image the same way then let the whole thing dry completely. I let mine dry over night. Step 8 - Use a glue like Glossy Accents to adhere your stained glass art to a card base. I will often add it to a card matte first then add it to a card base. I also lay a book on top for a few hours so it adheres better/stronger. I hope you enjoyed this tutorial and I hope you have a blessed Easter and a great day. These little piggy's from the NEW Pig Puns PAPER DOOR kit just crack me up, they are having so much fun in their pig puddles celebrating their youngness - lol! 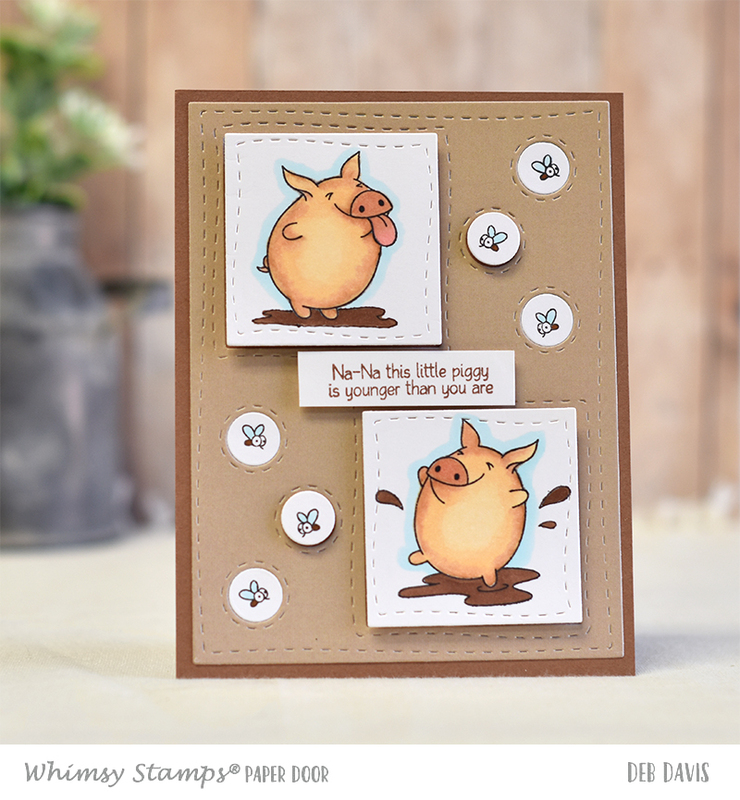 The NEW Pig Pun PAPER DOOR has all kinds of coordinated products to make all kinds of cute piggy cards. 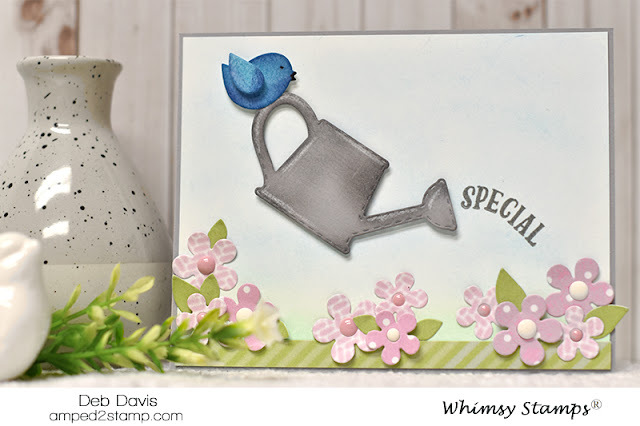 And for this card I coupled the kit with the NEW Whimsy Stamps PeekaBoo Window 4 die which fits the piggies AND the flies perfectly. I'm loving the designs and feel of the heavy weight papers included in our kits. 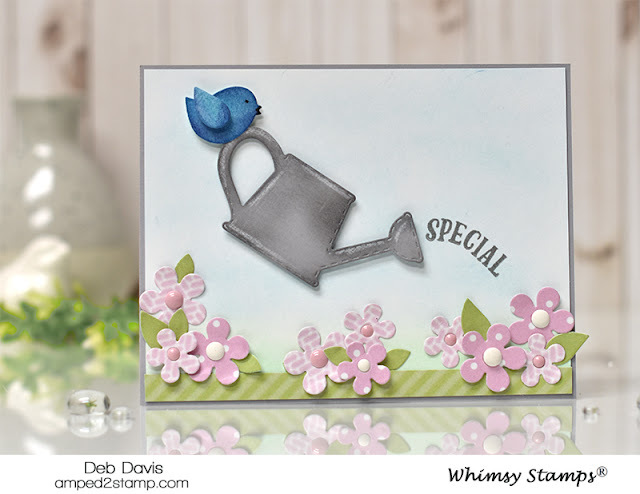 For this card I used one of the solid browns and tans but later this week I'll be posting cards using some of the super cute patterned ones too. Who do you have on your birthday card list that you want to say Na-Na too that you're younger than they are - lol? !